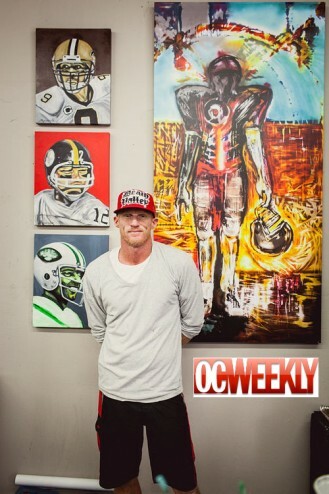 Marinovich, the former bad-boy Los Angeles Raiders quarterback, is still getting reactions to his art, which ranges from abstract pieces to more literal takes on famous athletes and music legends. An ESPNdocumentary released in December featured a stunning painting titled The Alchemist, an abstract piece on plexiglass that shows a shadowy football player emerging from bold orange and red hues that explode when light pierces through the plexiglass. Since the documentary’s release, Marinovich has happily been overwhelmed by requests for original works. Marinovich will have his next gallery show on Saturday June 2 .